This paper addresses the timing of a location’s historical transition from rural to urban activity. We test whether urbanization occurs sooner in places with higher agricultural potential and comparatively lower transport costs, using worldwide data that divide the earth’s surface at half-degree intervals into 62,290 cells. From an independent estimate of each cell’s rural and urban population history over the last 2,000 years, we identify the date at which each cell achieves various thresholds of urbanization. Controlling for unobserved heterogeneity across countries through fixed effects and using a variety of spatial econometric techniques, we find a robust association between earlier urbanization and agro-climatic suitability for cultivation, having seasonal frosts, better access to the ocean or navigable rivers, and lower elevation. These geographic correlations become smaller in magnitude as urbanization proceeds, and there is some variation in the effects across continents. Aggregating cells into countries, we show that an earlier urbanization date is associated with higher per capita income today. The online version of this article (doi: 10.1007/s10887-014-9104-x) contains supplementary material, which is available to authorized users. We have profited substantially from comments and suggestions of five anonymous reviewers as well as the editor of this journal. Nathan Nunn, Remi Jedwab, Justin Sandefur, Xiaofei Li and other colleagues at various seminars and conferences have contributed through discussions of previous versions of this paper. 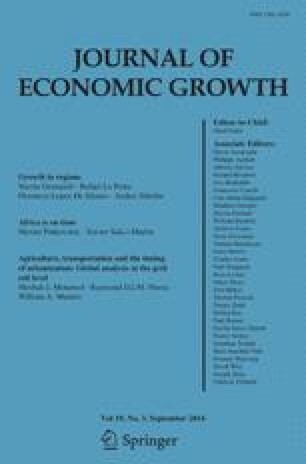 The first author notes that the views expressed are those of the author and should not be attributed to the Economic Research Service (ERS) or the United States Department of Agriculture (USDA).